Content copyright ©2005-2006 Picasa Fun. All rights reserved. Opinions expressed on Picasa Fun do not reflect the views of Google, Picasa, or any of their affiliates. Advice given here should be taken "as is" and the author is in no way, shape or form responsible for any damage caused by users applying tips here. Blogger Beta Images Requiring Picasa Contract? I don't think I could have seen this coming. It seems that users who now upload images onto Blogger Beta now have to agree to a Picasa Web Albums terms of service. Google claims no ownership or control over any Content submitted, posted or displayed by you on or through Picasa Web Albums. You or a third party licensor, as appropriate, retain all patent, trademark and copyright to any Content you submit, post or display on or through Picasa Web Albums and you are responsible for protecting those rights, as appropriate. By submitting, posting or displaying Content on or through Picasa Web Albums, you grant Google a worldwide, non-exclusive, royalty-free license to reproduce, adapt, distribute and publish such Content through Picasa Web Albums, including RSS or other content feeds offered through Picasa Web Albums, and other Google services. Ironically, I was unable to agree to the terms via Firefox, as it would not let me select the option (thankfully IE was more gracious, otherwise I would have been completely out of luck). I wonder how "legally binding" this contract is, since this refers to Picasa Web Albums and not Blogger. 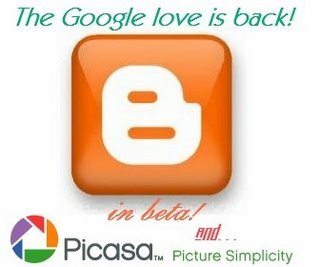 Either Picasa is going to host images for Beta Blogger (which may not be a good idea, especially with political/science blogs) or someone at Google was too lazy to write up a contract for Blogger Beta. Is it me, or does this not make any sense? ...since I've posted anything here! Well, I have decided to get back into the blogging mode. Mainly because I am still getting emails and comments about this weblog (which I almost gave up due to my last error here). Meanwhile, I am going to give this site a "fresh coat of paint" in order to make it look less like an Official Google Blog (as that can get you into trouble). I have been waiting for this for way too long! The Blogger (in beta) team has finally courted Picasa and its nothing but love from here on out! There are a few known issues that have to be resolved, which Blogger and Picasa have to work out (hopefully soon!) but here are some of the problems that they are working on. Errors posting from Picasa to Blogger if there are html validation problems. If you are signed in as a Blogger user, sign out, and then sign back in with your Google account (to post to the beta), you will receive an error. The work around is to close the window and repost from Picasa (signing in with your Google account). Once you post to beta, you will not receive a confirmation window. Once the rainbow progress indicator goes away in Picasa, open up your blog in your favorite browser to confirm the post. You cannot post from Picasa to Blogger in beta if you have backlinks turned on. Even though the label feature does not work yet, I'll be posting from Picasa (as I am more comfortable doing it that way, at least on this weblog). Note: I wonder if they will allow Hello to post to the new Blogger in Beta's? The boys and girls at Google have finally released a new (and improved) version of Picasa, allowing users to organize their photo's better as well as save image changes permanently. (Official Google Blog) We've also fixed a whole bunch of things in Picasa. Folders finally work as you'd expect, so people who've kept their photos meticulously organized in folders and subfolders can see them displayed the same way in Picasa. And we've added a shiny new feature to photo-editing: Save. Your Picasa edits can now be preserved when using other programs. The save feature is even undoable, so you never lose your original files. You can now use Picasa to upload photo's to Google Earth too, although if you have been using the beta for a while this is probably old news to you. Users who have either upgraded or downloaded the latest version will probably notice the Picasa Web Album's button is "slightly glowing." That is because now anyone can sign up for the Web Albums, although I am unsure whether or not if international users can upgrade to the pro account (as their were reports that this was not available to them). Testing to see whether this is really a "white" back ground or just a really dingy greyish white (using a photo).